Home › I BLOG › After False Alarm of an Imminent Ballistic Missile Attack on Hawaii: Fire someone –or get fired up about nuclear disarmament? After False Alarm of an Imminent Ballistic Missile Attack on Hawaii: Fire someone –or get fired up about nuclear disarmament? 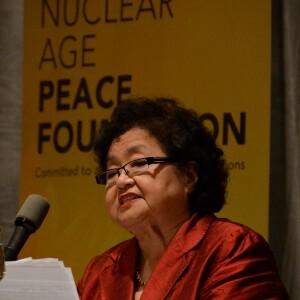 Setsuko Thurlow, who, as a 13 year old schoolgirl survived the U.S. atomic bombing of Hiroshima, received the Nuclear Age Peace Foundation’s Distinguished Peace Leadership Award on October 25, 2015. The calls to fire the Hawaii state employee who triggered the false alarm of an imminent nuclear attack on Saturday January 13, 2018, grow more shrill by the hour, as panic subsides and anger takes over. But how useful is that call? We have no inside knowledge of how competent or reliable this employee has been. If he or she has been a conscientious worker, it may be safer to assume that this person is less likely to repeat this awful blunder than to have complete confidence that the person who takes his or her place will not make the same mistake. More troubling is the broader failure of leadership, initiative and communications that let nearly 40 minutes go by before the state felt empowered to issue a cellphone notice to say that the 8.07 a.m. alarm was a mistake. That knowledge was already circulating by word of mouth and on social media while the wheels of state-led communications turned slowly, waiting on Federal permission to issue a correction. The Hawaii State Emergency Management Agency and the Governor have acknowledged the failure and the need to fix the system of notification and process for correction. Instead of clamoring for heads to roll, if we feel moved to act, it should be to pressure our leaders locally, nationally and internationally to do more to rid the planet of weapons that threaten to destroy us all. Dear friends, just a word about yesterday’s missile alert and its implications for us all. No doubt it is a day that we who experienced it shall never forget. Whether we were with our loved ones or miles apart, the sense of confusion, helplessness and inevitability weighed heavily until, at last, word came that it was a false alarm. Here’s the thing, we are made to be co-creators with God. And in so many ways, humanity has created, and does create beautiful and lasting things, art, literature, buildings and roadways, culture and music. We also create horrific things, like nuclear weapons. Perhaps if anything comes from yesterday’s terror it is to remind us that we are not by-standers; we are each of us creators with God. Nuclear weapons have no place on this planet. Bellicose saber rattling has no place on this planet. If nothing else, call a congressperson and demand an end to nuclear weapons; insist that our nation tone down its fiery rhetoric with North Korea, show up the first work day of each month at the Capitol in silent vigil against the winds of war. When enough of us get involved, things change, and what was once dismissed as impossible comes to be seen as inevitable. May God bless you all. St. Elizabeth’s Episcopal Church, Honolulu. The silent vigil is on the first WORKDAY of every month is from 11:30-12:00. The siren goes off at 11:45. All AM. 😇. The group stands in front of the Damien statue by the road.